Each issue we highlight a Radio Club and give you, the reader, all the information we have on that club and ask you to help us to fill the gaps in our knowledge. 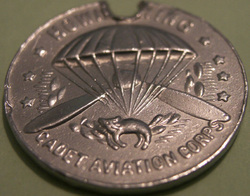 As you can no doubt guess, this issue’s Radio Club Highlight is the HOWIE WING AVIATION CORPS. Before I tell you what we know about the club, I will give some background information so that you know why this Club has been chosen for this issue. Kathy Hammel and her husband Jim, mp3 Old Time Radio Collectors in the U.S.A wandered into a 2nd Hand Record shop in California one day a couple of months back and spotted a 16" Transcription Disc hanging on a wall suspended by a push pin. It was a Kellogs disc with ads 1-6 on side 1 and 7-13 on side 2. Kathy didn't know a lot about 16" Transcription discs, (see Craig’s description elsewhere on this website) and had only ever seen one before hanging in a museum, so she was unsure it was genuine. In a bin below the hanging transcription she found 2 more 16" records with a World Broadcasting System red label, and a third pinned up on the wall opposite where the transcription with the ads was hung. The episodes were 77/78, 81/82, 83/84 of a series unknown to Kathy, Howie Wing. 79/80 was missing, along with about 250 others, but Kathy was not to know that then. Kathy then made contact with Jack French, OTR author and researcher and his excitement left no doubt the discs were genuine. Jack put her in touch with Jerry Haendiges who now has the discs and is working to recover the shows. Jack French put Kathy in touch with Karl Schadow, another researcher, and Karl went to work researching Howie Wing. During Karl’s research he discovered a document that indicated Howie Wing was also broadcast in Australia and so Kathy contacted me to see if I was interested in researching Howie Wing in Australia. I sure was! Later I returned the favour by involving Archie Hunter in Canada when a trail led to Canada where Howie Wing was also broadcast. During their research Karl discoverered that there was one more surviving Transcripton Disc of Howing Wing in the U.S. Library of Congress. Archie found one more in the Library and Archives Canada. Okay, that is the background to the story. At the moment Howie Wing research in Australia, Canada and America are continuing, here is what we have discovered thus far in Australia. It would appear that Grace Gibson brought Howie Wing to Australia during her term visiting Australia setting up ARTRANSA. In 1938 there was no protection for local actors or writers in place so the series was played from U.S. Transcription Discs and not re enacted from U.S scripts. This means that the shows were the original U.S shows with the original U.S actors. In Melbourne and Victoria the series commenced 24/09/1938 and was on Tuesday, Wednesday, Thursday. It is then showed as finishing 25/5/1940. (source - Listener-In) Wireless Weekly, October 14, 1938 shows a full-page ad for "Howie Wing - a Saga of Aviation". Broadcast each Tuesday, Wednesday and Thursday at 8.30 p.m. (2CH). In Sydney and NSW, Radio Pictorial (Mar 1939), shows HOWIE WING was broadcast on Tuesday, Wednesday and Thursday at 7:30pm on 2KO; 6:35pm / 6:45pm on 2TM and at 7:30pm on 2CH. Then we have copies of 16 different flying lessons by MacKenzie that appeared in the on-going editions of the Weekly. The edition of February 10,1940 starts his column with "The Howie Wing series over 2CH has come to a close, and this is our final Howie Wing column in "Wireless Weekly". The logos I have at the top of these pages come from the top of the weekly columns in Wireless Weekly. Basically Howie Wing was a 21 year old learning to be a pilot. He had lots of friends doing the same as well as a few enemies. We know many of the actors and those responsible for the series, what we don’t know is what series came to Australia. Did Australia get both U.S. series or did we get series 1 or series 2? There presumably was meant to be more series, but unfortunately the Originator/writer Willfred Moore died and for some reason he wasn’t replaced. Because the Howie Wing scripts survive in the U.S. if readers can email us with memories of the episode/storylines they remember, our U.S counterparts can compare them with the Scripts and tell us what series they belong to. What we don’t know, is why Robert McKenzie MC and how he was chosen. Smoky Dawson, so the Kellogs relationship with radio continued. 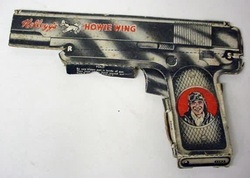 There were plenty of Howie Wing premiums, including some pictured here, like the cardboard Rubberband Gun, and the Medallion that could be purchased with box tops. There were also Aeroplanes of the World that could be cut out from the backs of Kellogs packs and stuck into a Howie Wing Album, as well as a Howie Wing game. them. I would love to include copies on the website and add the information to what we know about the series. All in All, Howie Wing had quite an impact on the youths of Australia. If you were a Howie Wing Cadet, why not tell us about your experience and what you enjoyed about being a member and also what you remember about the radio program. Whilst Howie Wing was huge in America and Canada, it seems that it was even bigger here. 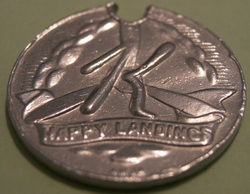 No examples of the flying lessons or weekly columns have been found in the other countries to date. To date, I have been unable to find any surviving episodes in Australia. The National Film and Sound Archives have searched their holdings and have been unable to find any examples or even any associated items. If you have any surviving examples, please let us know. We are willing to make transfers to CD for you so that you can listen to them yourself. Fortunately Radio Station staff were fans of the various shows and most surviving episodes of series and serials are as a result of staff ‘rescuing’ the Transcription Discs for future generations. At the current count, out of about 250 episodes, 7 survive in the U.S and 1 in Canada. That’s not enough, we need to find more. Huge Thanks to Tony Austin, Cereal Collector Extraordinaire, for the premium Info and most of the Howie Wing Australian information. Tony was just waiting for someone to ask him about Howie Wing.